So. We’re gonna start here, because it makes the most sense to start at the beginning. This topic is huge. Massive even. I’m going to do this in parts, or no one would see me for about a month. While we should note that the earliest example of a lock and key mechanism was discovered in Nineveh, Assyria, and is expected to be between 5-6 thousand years old, there really isn’t any way to know whether it was the Assyrians, Egyptians, Babylonians, or something(one) else that actually invented it. Just like now, technology was often stolen/traded/shared between the populaces and because these regions of the world existed for so long, splitting hairs on who the “first end user” was is an act of futility. Back in Mesopotamia, in the days of Ancient Egypt, some ridiculously inventive human being (or alien, if that’s your thing) came up with the idea of the millennia. Create a device that only opens if you have a special tool to open it. It would have 1 or 2 brackets on the wall beside the door, and one or two brackets mounted to the door itself. The brackets would be aligned to allow a wooden bar, or bolt, to slide through. That bar would lock into place on a number (3) pins installed in the end most bracket mounted to the wall. Looking at the picture, the first thing you notice is the lack of springs, meaning there was no downward pressure forcing the pin into the bar. As expected for a first attempt, it had it’s flaws. The 3 pin drawback was probably not the problem then that it would be now. Few of those alive back then would have figured out what the key actually did to the lock to make it turn, making picking a rare skill. A wooden lock wouldn’t happen now. Not on any serious level. Egyptians/Assyrians would have used wood for it’s availability, not it’s durability. After all, if you hit a wood lock hard enough it’s not going to put up any real resistance, and because the doors were made of either stone or wood the lock would be the logical attack point. All 3 of these things have been addressed over time. 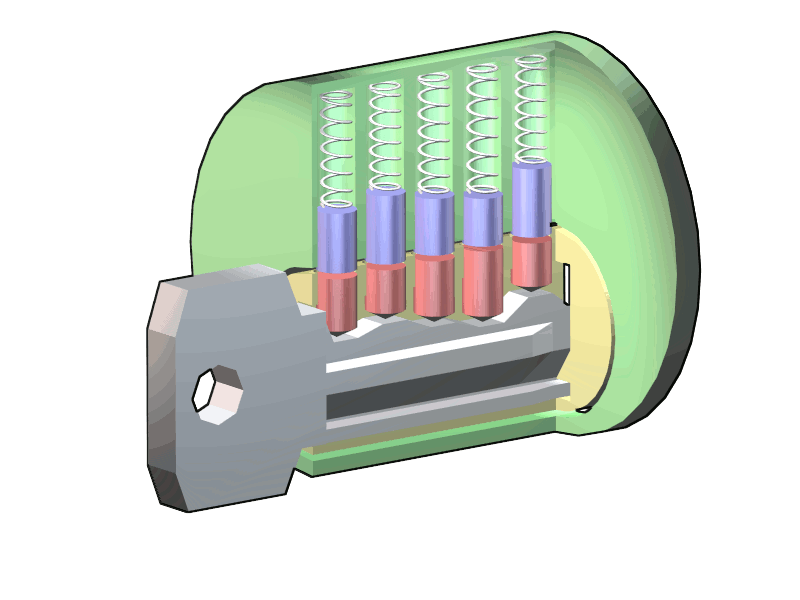 Locks are no longer made of wood, the amount of tumblers in the locks has increased, sometimes well beyond three. Keys are also no longer made of wood. The locks themselves were massive, sometimes over 2 feet long. Remember that the most reliable way to lock a door is to put a bar across it. Bars, however, can simply be pulled out if the lock is on the outside of the door, meaning that up until this point in history doors could not be locked from the outside. We know, after a few thousand years, that the greatest use for a lock is to keep people out while you are not there. Having a lock that only works while you are inside the house doesn’t allow for that. The pins would go up through the bar into the bracket holding the bar in place, effectively allowing you to lock your door from the outside. Mind you, instead of sliding the bolt into and out of the door frame, you are sliding the bar in and out of the guides that hold it in place. Most locks weren’t long, like the one sketched above, but as mentioned earlier the longest ones were up to 2 feet. The majority were shorter. It wasn’t until Rome that locks started to be mounted into, instead of onto, doors, but that’s another article. Interestingly enough the Roman locks were also significantly easier to defeat than the Egyptian locks were, and the Greek variants were even easier than that. I’m not sure locksmithing was a term the ancient Egyptians had a word for, but they should have. A 5000 year old design that is still the basic idea for what we use modernly is kind of awesome. Great goods from you, man. I have understand your stuff previous to and you are just too magnificent. I actually like what you’ve acquired here, certainly like what you’re saying and the way in which you say it. You make it enjoyable and you still care for to keep it smart. I cant wait to read far more from you. This is actually a great website. Wow, superb weblog format! How long have you ever been blogging for? you make blogging look easy. The total glance of your site is wonderful, let alone the content material! Hello, Neat post. There is an issue with your site in internet explorer, could check this¡K IE nonetheless is the marketplace leader and a large component of folks will omit your wonderful writing because of this problem. Thank you for sharing superb informations. Your web site is so cool. I’m impressed by the details that you have on this website. It reveals how nicely you perceive this subject. Bookmarked this web page, will come back for extra articles. You, my friend, ROCK! I found simply the information I already searched everywhere and simply couldn’t come across. What an ideal website. Usually I don’t learn post on blogs, however I would like to say that this write-up very forced me to check out and do it! Your writing style has been amazed me. Thank you, quite nice article. Excellent goods from you, man. I’ve understand your stuff previous to and you’re just too magnificent. I actually like what you have acquired here, certainly like what you are stating and the way in which you say it. You make it entertaining and you still take care of to keep it sensible. I cant wait to read much more from you. This is actually a terrific web site. I would like to thank you for the efforts you have put in writing this site. I’m hoping the same high-grade site post from you in the upcoming also. Actually your creative writing skills has encouraged me to get my own web site now. Actually the blogging is spreading its wings fast. Your write up is a good example of it. Hi there, I found your web site by way of Google even as looking for a comparable topic, your web site came up, it seems good. I’ve bookmarked it in my google bookmarks. Thank you, I have just been looking for information about this subject for ages and yours is the greatest I’ve came upon till now. However, what in regards to the bottom line? Are you sure about the supply? Thanks for every other great article. Where else may anyone get that kind of info in such a perfect approach of writing? I have a presentation subsequent week, and I’m at the look for such info. hey there and thank you for your info – I’ve certainly picked up something new from right here. I did however expertise several technical issues using this website, as I experienced to reload the web site many times previous to I could get it to load correctly. I had been wondering if your web hosting is OK? Not that I’m complaining, but slow loading instances times will often affect your placement in google and could damage your high quality score if advertising and marketing with Adwords. Anyway I am adding this RSS to my email and could look out for much more of your respective fascinating content. Ensure that you update this again soon..
You actually make it seem really easy with your presentation but I to find this topic to be really one thing which I think I’d never understand. It sort of feels too complex and very wide for me. I’m looking forward for your next submit, I¡¦ll try to get the grasp of it! Hello, Neat post. There is an issue along with your site in internet explorer, would check this¡K IE still is the marketplace chief and a big section of other folks will leave out your great writing due to this problem. Generally I don’t read post on blogs, however I wish to say that this write-up very forced me to take a look at and do it! Your writing style has been surprised me. Thank you, quite great post. I¡¦m no longer certain the place you are getting your information, but great topic. I must spend some time studying more or working out more. Thanks for great info I was in search of this info for my mission. Whats Going down i’m new to this, I stumbled upon this I’ve discovered It absolutely useful and it has aided me out loads. I’m hoping to give a contribution & aid other users like its helped me. Good job. Needed to draft you the tiny observation to help give thanks again for all the pleasant tricks you’ve documented at this time. It has been certainly incredibly open-handed of you in giving freely all that a number of us might have supplied for an e book in making some bucks for themselves, mostly seeing that you could possibly have tried it in case you considered necessary. The points as well acted as a fantastic way to be aware that most people have the same desire just as my personal own to figure out much more with regards to this issue. I’m sure there are several more fun periods up front for folks who scan your site. hi!,I love your writing so a lot! percentage we keep in touch more about your post on AOL? I need an expert on this house to unravel my problem. May be that is you! Taking a look forward to peer you. Hiya, I am really glad I’ve found this information. Nowadays bloggers publish only about gossips and internet and this is actually irritating. A good blog with interesting content, that’s what I need. Thank you for keeping this site, I will be visiting it. Do you do newsletters? Can’t find it. I want to express my affection for your kindness for those individuals that actually need help with in this concern. Your real commitment to getting the solution all around became quite functional and has usually allowed many people much like me to arrive at their ambitions. Your new helpful help can mean a great deal to me and even further to my colleagues. Warm regards; from everyone of us. Hi there, I discovered your blog via Google while searching for a similar topic, your site came up, it looks great. I have bookmarked it in my google bookmarks. Thank you for sharing superb informations. Your site is very cool. I’m impressed by the details that you have on this site. It reveals how nicely you perceive this subject. Bookmarked this website page, will come back for more articles. You, my friend, ROCK! I found just the information I already searched everywhere and simply couldn’t come across. What a perfect web-site. Thanks for every one of your hard work on this web site. My mother delights in getting into investigation and it’s obvious why. My spouse and i learn all concerning the lively ways you give sensible guides on the web blog and therefore improve response from the others on this area of interest plus our own child has always been being taught a great deal. Take advantage of the rest of the new year. You are carrying out a splendid job. I and also my friends were found to be going through the good items found on your web site and instantly came up with an awful feeling I had not expressed respect to the blog owner for those techniques. All the boys became as a consequence stimulated to study all of them and now have absolutely been loving those things. I appreciate you for being so kind and for making a choice on varieties of perfect areas most people are really eager to be informed on. My very own honest apologies for not expressing gratitude to sooner. Hello.This post was really fascinating, particularly because I was searching for thoughts on this issue last Monday. Thank you for sharing excellent informations. Your web-site is very cool. I’m impressed by the details that you have on this web site. It reveals how nicely you understand this subject. Bookmarked this web page, will come back for more articles. You, my friend, ROCK! I found just the info I already searched everywhere and simply could not come across. What a great web site. Someone essentially lend a hand to make significantly articles I would state. This is the very first time I frequented your web page and to this point? I amazed with the research you made to create this actual submit amazing. Fantastic task! Thank you for all your valuable work on this website. Ellie really loves working on investigation and it is easy to see why. Most people know all of the lively form you make great information by means of this blog and as well as attract response from people on the concern then our own simple princess is undoubtedly being taught a lot. Take advantage of the remaining portion of the new year. You have been carrying out a stunning job. I would like to thnkx for the efforts you’ve put in writing this site. I’m hoping the same high-grade web site post from you in the upcoming as well. In fact your creative writing skills has encouraged me to get my own web site now. Really the blogging is spreading its wings rapidly. Your write up is a great example of it. I definitely wanted to construct a brief note to be able to express gratitude to you for these stunning instructions you are showing at this site. My extensive internet search has at the end of the day been rewarded with good suggestions to exchange with my close friends. I would tell you that many of us readers actually are very blessed to live in a fine website with many awesome people with great secrets. I feel very much lucky to have encountered your entire website and look forward to plenty of more enjoyable minutes reading here. Thanks once again for a lot of things. You really make it appear so easy along with your presentation however I to find this topic to be really one thing which I believe I might by no means understand. It seems too complex and very wide for me. I’m having a look ahead to your subsequent publish, I will attempt to get the cling of it! Hello.This article was really remarkable, particularly since I was searching for thoughts on this topic last Friday. I have been surfing online more than 3 hours today, yet I never found any interesting article like yours. It¡¦s lovely value sufficient for me. Personally, if all website owners and bloggers made good content as you did, the web might be much more useful than ever before. whoah this weblog is wonderful i love reading your articles. Stay up the good work! You know, many persons are searching around for this info, you can help them greatly. Thanks so much for giving everyone a very brilliant possiblity to read articles and blog posts from this blog. It’s usually very superb and stuffed with a great time for me personally and my office mates to visit your website a minimum of 3 times weekly to see the newest guides you have. And indeed, I am usually motivated with all the awesome thoughts you serve. Selected 4 ideas in this posting are indeed the best we’ve had. Normally I do not learn post on blogs, but I wish to say that this write-up very pressured me to try and do it! Your writing taste has been amazed me. Thank you, quite great article. I wish to express appreciation to you just for rescuing me from this particular difficulty. Right after researching through the world-wide-web and getting suggestions that were not helpful, I thought my life was over. Living without the presence of approaches to the problems you’ve solved through the guideline is a serious case, and those that might have in a wrong way damaged my entire career if I hadn’t come across your web site. The ability and kindness in controlling every part was vital. I don’t know what I would’ve done if I hadn’t encountered such a solution like this. I’m able to at this point look ahead to my future. Thank you so much for the impressive and results-oriented help. I will not be reluctant to refer the website to any person who would need support on this subject. Normally I do not learn article on blogs, however I would like to say that this write-up very pressured me to try and do so! Your writing style has been surprised me. Thanks, very great post. I would like to thnkx for the efforts you’ve put in writing this site. I am hoping the same high-grade web site post from you in the upcoming as well. In fact your creative writing abilities has inspired me to get my own blog now. Actually the blogging is spreading its wings fast. Your write up is a great example of it. Fantastic goods from you, man. I’ve understand your stuff previous to and you’re just extremely wonderful. I really like what you’ve acquired here, certainly like what you’re stating and the way in which you say it. You make it enjoyable and you still take care of to keep it smart. I can’t wait to read much more from you. This is actually a wonderful website. I simply wanted to say thanks yet again. I do not know the things that I might have created without the creative ideas documented by you about this problem. It previously was the troublesome difficulty in my opinion, however , considering this well-written avenue you handled that took me to cry over contentment. I am just grateful for your information and then trust you are aware of a great job you have been doing teaching men and women using a web site. More than likely you have never come across any of us. It is really a nice and helpful piece of information. I am glad that you shared this helpful info with us. Please stay us informed like this. Thanks for sharing. I must convey my appreciation for your kind-heartedness for visitors who have the need for guidance on this subject. Your very own dedication to passing the solution all through appears to be extraordinarily useful and have usually made guys and women like me to reach their dreams. This insightful guideline means much to me and additionally to my fellow workers. With thanks; from each one of us. Thank you for another informative web site. Where else may just I get that kind of info written in such an ideal manner? I have a challenge that I am simply now working on, and I have been at the look out for such information. Hello, Neat post. There’s a problem together with your site in web explorer, would check this¡K IE still is the marketplace leader and a large component of other people will pass over your fantastic writing because of this problem. Thanks so much for giving everyone an extremely spectacular possiblity to read critical reviews from this blog. It is often so beneficial plus stuffed with fun for me personally and my office mates to visit your web site really 3 times weekly to find out the new issues you will have. And of course, I’m so usually satisfied with all the magnificent tips you serve. Certain 3 ideas on this page are certainly the most impressive we’ve ever had. Wonderful website. Lots of helpful info here. I am sending it to a few buddies ans also sharing in delicious. And obviously, thank you to your sweat! I have learn some good stuff here. Certainly worth bookmarking for revisiting. I surprise how a lot effort you place to make this type of great informative site. Wow, wonderful weblog layout! How long have you ever been running a blog for? you made running a blog glance easy. The full look of your website is wonderful, as smartly as the content material! My spouse and i felt now delighted that Raymond managed to do his preliminary research because of the ideas he gained through the web pages. It’s not at all simplistic to just find yourself giving out information and facts which usually people today have been trying to sell. And we remember we have the website owner to appreciate for this. The main illustrations you’ve made, the easy site menu, the friendships you can assist to create – it’s many overwhelming, and it’s really helping our son and our family consider that that article is excellent, and that is incredibly essential. Thank you for everything! Helpful info. Fortunate me I discovered your website accidentally, and I’m stunned why this accident didn’t took place earlier! I bookmarked it. I wanted to send a brief word so as to appreciate you for those awesome facts you are giving out here. My considerable internet lookup has at the end been recognized with excellent facts to exchange with my visitors. I ‘d repeat that most of us readers are definitely endowed to dwell in a fantastic website with many wonderful individuals with very beneficial points. I feel somewhat blessed to have encountered your entire webpage and look forward to many more pleasurable minutes reading here. Thanks once more for everything. qOTpHG Muchos Gracias for your article post. Great. zrD5BG This excellent website really has all of the info I needed about this subject and didn at know who to ask.